Neurofeedback: an alternative to medication? Whether we are talking about symptoms like anxiety or depression, mood disorders, or learning difficulties, the field of mental health is dominated by two forms of treatment: ‘talk therapy’ and medication. As the less invasive and risky option, talk therapy is usually the first port of call for people who do not have extreme problems. This form of therapy can be very effective, but it is not without its drawbacks. It often takes a long time to produce results and, in the meantime, the sufferers are losing valuable time, and in some cases are at risk of causing harm to themselves or others. In order to secure more immediate relief, therefore, many people are prescribed medication, most commonly anti-depressants. In fact, about one of out every six Americans at any one time is taking psychiatric drugs. The advantage the pharmaceutical approach has over talk therapy is that it goes more directly to the source of mental health problems: the brain itself. 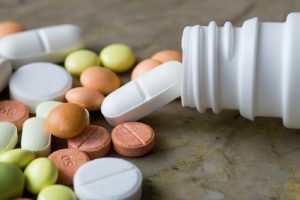 The problem is that while medication provides a less roundabout approach to the problem than talking, it is also an extremely blunt instrument for an organ as complicated and sensitive as the brain. Despite their widespread use, there is surprisingly little consensus on how common forms of psychiatric medication actually work, or even if they work at all. Many of them have serious and frequent side-effects that can be frightening if not outright dangerous. Antidepressants and other drugs certainly change the balance of hormones and other chemicals in the brain, but not in a way that we can precisely control or fully understand. All too often, prescriptions are a form of educated guesswork, based on looking at symptoms rather than on what is going on in the brain itself. As Daniel Amen has quipped, psychiatrists ‘remain the only medical specialists that rarely look at the organ they treat.’ Imagine having heart palpations and being prescribed an experimental and potentially dangerous drug for heart disease without ever having had a scan or even getting your pulse checked. As crazy as that sounds, it’s not too different from the reality of prescription drugs for mental health problems. What’s more, even medication that seems to be working may not actually be affecting the core problem. For example, if we think of one part of the brain as sending out too many messages telling a person to feel anxious, an anti-anxiety drug that appears to soothe these symptoms may work by blocking the messages from reaching their destination, while the part of the brain responsible for producing the anxious thoughts remains untouched. While the sufferer may find relief, the underlying problem remains. This might not be such a problem if it wasn’t for the reality that, over time, the brain builds up a tolerance for these medications. Just as the brain gets used to regular doses of caffeine or alcohol, psychiatric medications tend to become less effective the longer they are used, allowing the underlying problems to reassert themselves. The sad reality is that millions of Americans bounce from one form of medication to another, sometimes experiencing temporary relief, but then feeling the dejection of going back to square one when the drug becomes less effective. In our increasingly medicated society, many are asking if there is another way. While relatively new, Neurofeedback is increasingly being recognized as a powerful alternative to the standard binary option of talk therapy or medication. Unlike talk therapy, it goes directly to the root of the problem in the brain and doesn’t require spending a lot of time talking, which is not right for everyone. Unlike medication, however, it is non-invasive, has no side effects (other than feeling a bit tired after a session), and gets to work directly on the problem. Neurofeedback is essentially structured exercise for the brain, and, by using the brain scan technology, you can work on precisely the parts of your brain that need improvement. Instead of using a chemical band-aid to smother the problem, Neurofeedback gives you the opportunity to hone your mental muscles and find sustainable and deeply-rooted relief from the problems that are holding you back. Depending on the circumstances, Neurofeedback may allow you to lower your dose of medication, switch to a form with fewer side effects, or dispense with medication altogether. For more information about Neurofeedback in Los Angeles, get in touch. You can call or fill out the contact form. Note: Coming off medication can have dangerous side effects. If you are taking medication, never change your dose without first consulting your prescribing psychiatrist.